The Aristarchus region is one of the most diverse and interesting areas on the Moon. 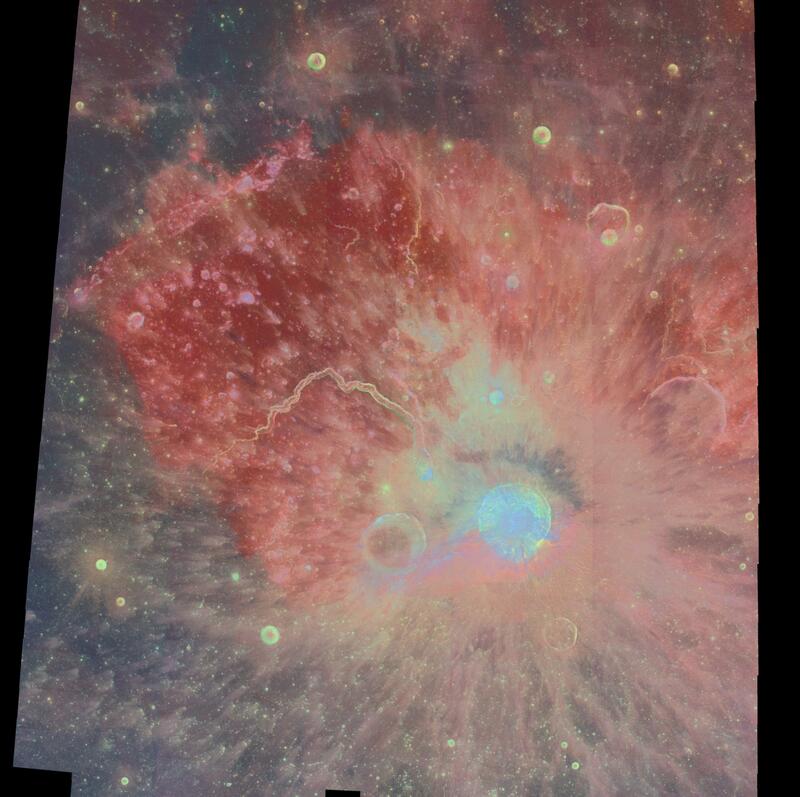 About 500 Clementine images acquired through three spectral filters (415, 750, and 1000 nm) were processed and combined into a multispectral mosaic of this region. Shown here is a color-ratio composite, in which the 750/415 ratio controls the red-channel brightness, it inverse (415/750) controls the blue, and the 750/1000 ratio controls the green. Color ratios serve to cancel out the dominant brightness variations and topographic shading, thus isolating the color differences related to composition or mineralogy. The Aristarchus plateau is a rectangular, elevated crustal block about 200 km across, surrounded by the vast mare lava plains of Oceanus Procellarum. Clementine altimetry shows that the plateau is a tilted slab sloping down to the northwest, that rises more than 2 km above Oceanus Procellarum on its southeastern margin. The plateau was probably uplifted, tilted, and fractured by the Imbrium basin impact, which also deposited hummocky ejecta on the plateau surface. The plateau has experienced intense volcanic activity, both effusive and explosive. It includes the densest concentration of lunar sinuous rilles, including the largest known, Vallis Schroteri, which is about 160 km long, up to 11 km wide, and 1 km deep. The rilles in this area begin at 'cobra-head' craters, which are the apparent vents for low-viscosity lavas that formed vents for 'dark mantling' deposit covering the plateau and nearby areas to the north and east. This dark mantling deposit probably consists primarily of iron-rich glass spheres (pyroclastics or cinders), and has a deep red color on this image. Rather than forming cinder cones as on Earth, the lower gravity and vacuum of the Moon allows the pyroclastics to travel much greater heights and distances, thus depositing an extensive regional blanket. The Aristarchus impact occurred relatively recently in geologic time, after the Copernicus impact but before the Tycho impact. The 42 km diameter crater and its ejecta are especially interesting because of its location on the uplifted southeastern corner of the Aristarchus plateau. As a result, the crater ejecta reveal two different stratigraphic sequences: that of the plateau to the northwest, and that of the portion of Oceanus Procellarum to the southwest. 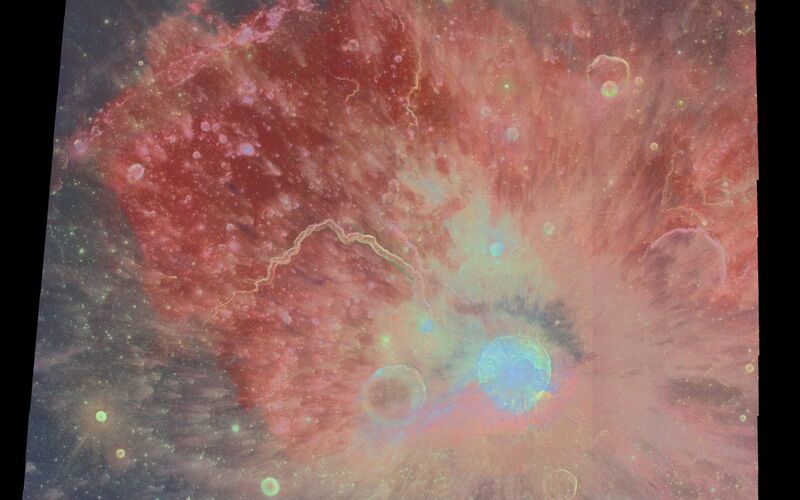 This asymmetry is apparent in the colors of the ejecta as seen in this image, which is reddish to the southeast, dominated by excavated mare lava, and bluish to the northwest, caused by the excavation of highland materials in the plateau. The extent of the continuous ejecta blanket also appears asymmetric: it extends about twice as far to the north and east than in other directions, approximately following the plateau margins. These ejecta lobes could be caused by an oblique impact from the southeast, or it may reflect the presence of the plateau during ejecta emplacement. Two dark blue spots in the center of Aristarchus represent tan especially interesting discovery. The infrared spectral properties measured by Clementine are consistent with a composition of almost pure anorthosite, the primitive rock type produced by the lunar magma ocean. 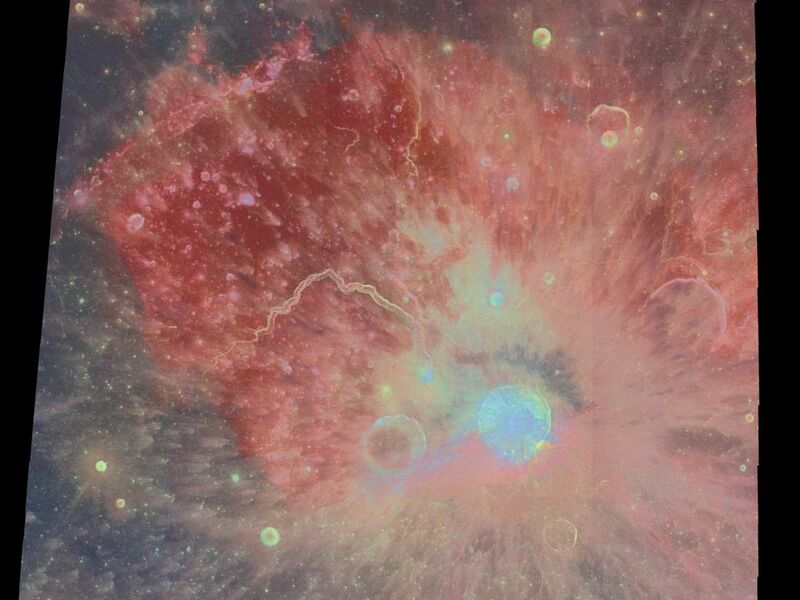 This is the first discovery of a major exposure of anorthosite in this region of the Moon, well within the boundary of the hypothetical Procellarum basin. Don Wilhelms (Geologic History of the Moon, USGS Professional Paper, 1984) proposed that the giant Procellarum basin entirely removed the upper anorthositic crust from the north-central nearside of the Moon.